I want to pour a Monolithic foundation for my garage but I need to understand how to form it based on the need to slope the floor. How do I set the inside tapered form and hold it to the outside form at the same time? The item#1 in the photo below is what you are questioning I believe. In the photo the slab is to be poured almost level. Your case is sloped but the form will work the same. Either you cut the form tapered to follow your top of the sloping slab or make the bottom of the form match the sloping slab. Either way you do it this 2x4 or 2x6 form is only there till the concrete is harden enough so you can remove to finish the face of the curb, the same way you would finish curb & gutters or normal curb walls. 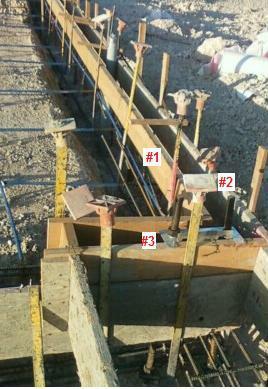 The photo shown here is part of a garage floor poured monolithic with the foundation. Item 2 in the photo is the 2x12 outside form that outlines the perimeter of the garage. Item#3 is the short wall for the jamb on either sides of the garage door. In the photo you can see the hold downs for the jambs.